This is a feedback to a write-up “Utter three words for Jesus, At least? * appeared in one of the editions of Light of Life magazine published from Mumbai, India. In its July 2009 edition the writer Mr. Duke Jayraj wrote This article. That was really a thought-provoking read. Yes how well it would have been if every Christian believer followed this formula of three little words, “Come and See”, No doubt there would have been a tremendous growth in number of Christ’s followers. Unfortunately, this is not happening even among ten percentages of the believers. Albert McMackin Billy Graham incident is an apt illustration in the write-up. The author presented the theme in an orderly way. But unfortunately, in the concluding paragraph, the writer said, “Jesus took 3 nails on his body to die for you.” This is surprise information to me. Where in the Bible it’s mentioned that Christ is crucified on 3 nails, nowhere in the Bible I could find this 3 nails story. I doubt if it is there in the writer’s new found version-NLT- (read his article on NLT version in one of the previous issue of Light of Life). I firmly believe no version gives the number of nails in which Christ is crucified. 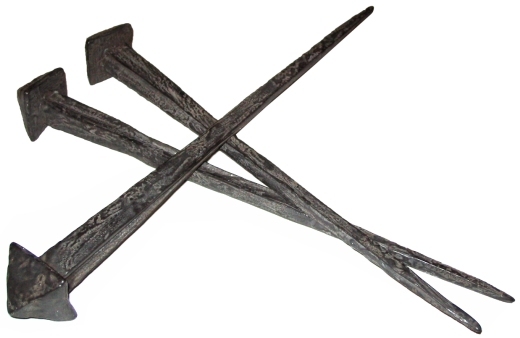 It is a common belief that Christ is crucified on three nails. Even some believers while preaching and praying use this 3 nails phrase! Some Christian songwriters too have composed their songs with this 3 nails theory. This is a common mistake happened and is still prevailing in many Christian groups. Of course, the number of nails is not a criterion here. In Christ’s time, there were different forms of crosses were used for crucifixion so we cannot come to a conclusion that what type of cross was used for Christ’s crucifixion. So, when we preach, pray and write using this phrase will create a kind of confusion. Of course, His Coming on this earth, Crucifixion, Resurrection and the Second Coming is more important than anything else to a real believer. The situation forced me to note this point for the further correction of my fellow Christian believers. My sincere thanks to Mr. Duke Jeyraj for this thought-provoking piece. Utter three words for Jesus, At least? “Andrew, can you preach so that 300 people are saved and baptized after a single sermon like your brother Peter?” “No way!” “What can you do then?” “I introduce people to Jesus.. I introduced my brother Peter to Jesus. It was I who told him, ‘Bhaiya, (brother) I’ve found the Messiah!” Don’t forget… I was the one who introduced the little lad with five loaves and two fishes to Jesus. Arranging an appointment with Jesus for some Greek Philosophers… that was my job” (Jn. 1:40-42; 6:68;12:23-25). “Philip, how about a sermon dripping with eloquence?” “Sorry, But I can utter words…just three words: “Come and See’!” The result? Nathaniel came to Christ! (Jn. 1:46 NLT). Well, these witness operations don’t require a silver tongue. But all they need is a tongue that is willing to be used for Jesus’ service. It may mean handing out a tract saying, “This write-up talks about Jesus.. a person who change my life!” it may involve teaching some small kids Bible stories. It may mean guiding a person to a place where he can hear an unclouded presentation of the Gospel… a church or fellowship or a Gospel meeting. Going tongue-in-cheek wondering if this operation would impact anybody at all in this age? Hang on and listen to the story. Albert McMacking had a thick pal in high school. When a Bible-thumping evangelist named Mordecai Ham was in town, he kept pestering this friend of his to go with him and hear Mordecai Ham preach. When this particular friend of Albert’s could no longer take this bugging he consented to go to the meetings. The miracle of miracles-he turned his life to Christ in one of the meetings! Want to guess who the ‘friend’ was? Hold your breath and take his thunderbolt-He was a chap called Billy Graham (event narrated as per information from Billy Graham’s autobiography, Just As I Am!). Yes, it was Billy Graham, the man who went on to become the preacher who’d announce the Gospel to the most number of people on the planet in all of history! Don’t waste any time and try out Operation Andrew-Philip: A Billy Graham might be waiting for your “Come and See!” Jesus took 3 nails on His body to die for you. Can’t you at least say these words- Come and See-to witness for Him?